Mountain View Residents Protest: "Kavanaugh Lied!" Americans protested Brett Kavanaugh’s Supreme Court nomination across the country in over 200 locations on October 3rd. At a busy intersection in Mountain View, California, even a man with a Make America Great Again helmet said, "Kavanaugh probably did it". Mountain View, California is, in large part, a progressive city. Earlier this week, a majority of City Council members agreed to allow marijuana retailers to open up shop here. About 30 people showed up with only a few hours notice at a demo at Gateway Park in Mountain View last night. They said with their signs and in interviews that Brett Kavanaugh lied in his testimony regarding Dr. Christine Blasey Ford's credible allegation of sexual assault. They gathered to show the country that women and men will hold Republicans accountable come November. Mountain View is not without its colorful characters. 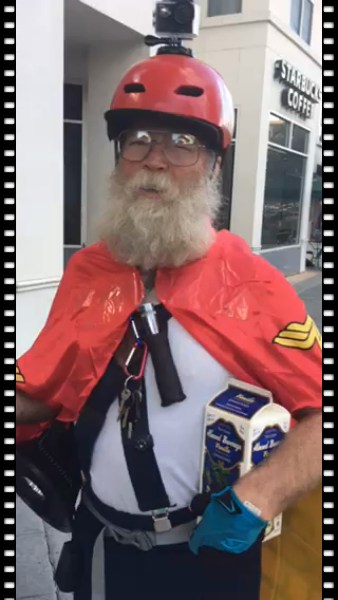 "Maga-Man", so named for his Make America Great Again message and creative costuming, urges people to vote Republican with great amplification at the busy crossroads of El Camino Real and Castro Street several times a week. He stood in the middle of the intersection blasting his message at about the same time as people started to gather at the Gateway Park demo on the southeast corner. As it turns out, even Maga-Man thinks Kavanaugh likely lied about what really happened that fateful night in 1982. In this family, Black Lives Matter, Women's Rights are Human Rights, No Human Being is Illegal, Science is Real, Love is Love.